Olympus Labs Superior Protein Delivers Huge on the "Extras"! Olympus Labs has always been the brand of Demigods that is unafraid to test new natural ingredients to give their users an edge in the gym. They’ve had a run of fantastic pre workouts, fat burners, testosterone optimizers, natural anabolics, amino acids, and more. But all of those muscle-builders and fat-attackers mean nothing without one thing: protein! 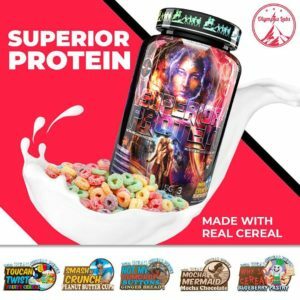 One Demigoddess to rule them all – Olympus Labs Superior Protein sails into new waters with tons of “extras” — both in taste and in profile! With such exotic and oftentimes aggressive formulas, the team at Mount Olympus knew they couldn’t come out with a plain jane protein powder once they decided to enter this corner of the market. They had to do it their way. And they sure did. First, let’s re-establish our goals. Despite their unforgettable fat burners in BloodShr3d and Ign1te, Olympus Labs is a muscle-building brand. Knowing that, it was easy for them to know their target: the gainz demographic. Something new to boost growth hormone production! 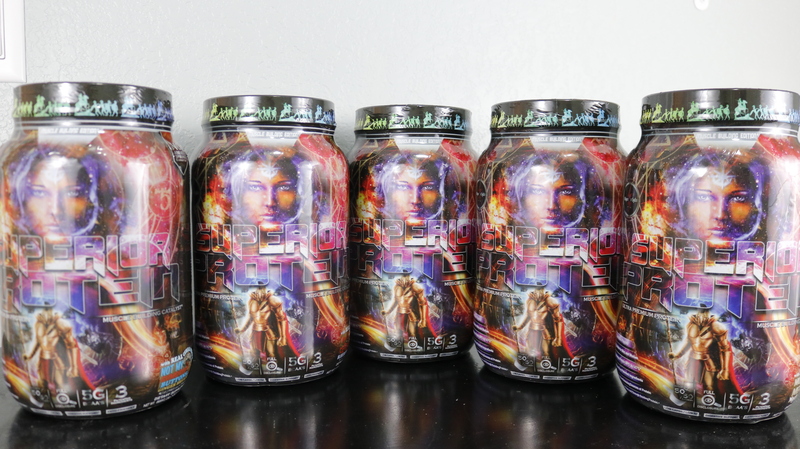 And with that, they formulated Superior Protein, a protein powder that checks the above boxes and more, launching with five rockstar flavors (four of which have tons of cereal pieces inside!) and one of the craziest looking labels we’ve ever laid our eyes upon. A Protein with a Muscle Building Edition! It also comes in two versions — a regular one, and a muscle building edition that brings our new GH-booster alongside for a post-workout or pre-bed enhancement! 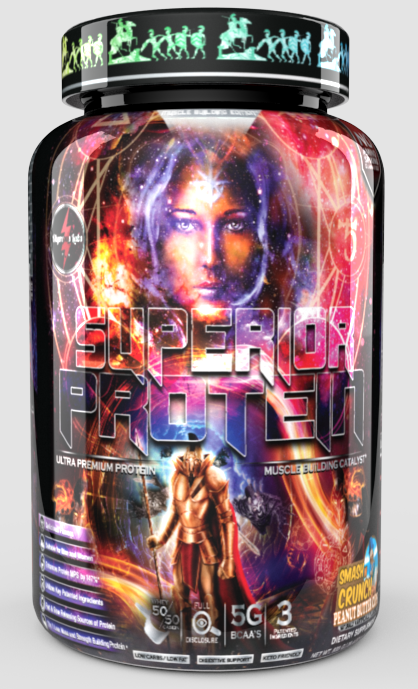 See the main Superior Protein launch page at NaturalBodyInc where you can save 10% with coupon code SUPER10 through November 5th. Don’t miss the stack-and-save deals to bundle up multiple flavors to save on each tub! Made by Nutrition 21, the experts in Chromium and Insulin management, Velositol can boost Muscle Protein Synthesis by using chromium and a ‘tickle’ of insulin-spike from amylopectin! 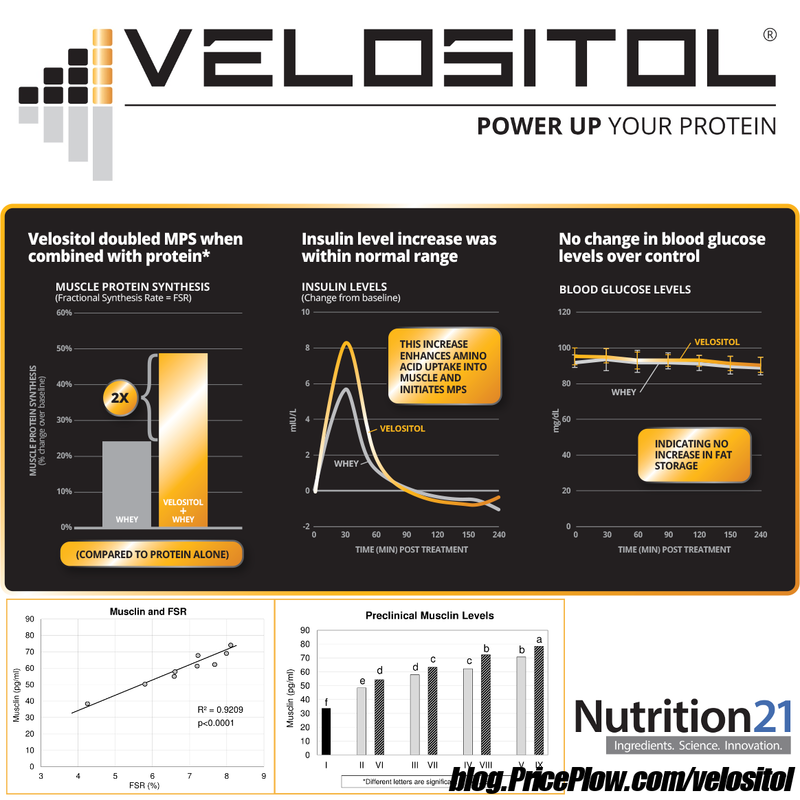 Velositol is a relatively new ingredient from Nutrition 21 (the same company that brings you the Nitrosigine NO booster) that uses chromium, a known natural insulin-enhancer, to increase muscle protein synthesis. It generally works like this: using a touch of high-amylopectin starch, Velositol tickles an insulin spike from your system, but not a blood sugar spike (not by itself, at least — the protein and inclusions will do that here). The chromium complex it’s paired then takes advantage of that and helps boost nutrient intake into the cell, boosting muscle protein synthesis (MPS) – especially in a post-workout environment. 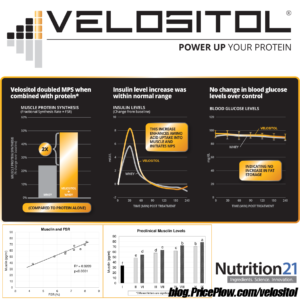 Velositol was originally tested in humans a “sub-optimal” protein environment — 2g Velositol with 6g protein and compared it against 6g protein alone. This allowed Nutrition 21 to see if they had something special here, because 6g protein alone will induce some MPS, but certainly leaves room for improvement. At these levels, the ingredient absolutely worked — fractional protein synthesis was nearly doubled! So Nutrition 21 was on to something. But what about legit protein doses? 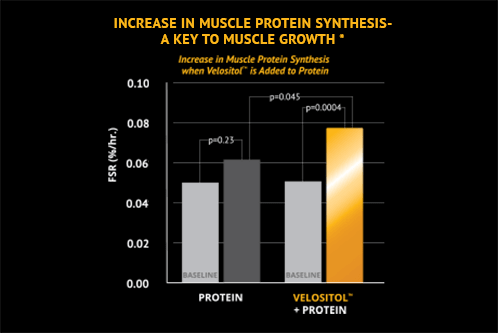 Clinical research shows Velositol effectively doubles the power of “suboptimal doses of protein” when the two are consumed together. We’re cautious when we see graphs like this, but Nutrition 21 has animal data on larger doses too! Next, Nutrition 21 took human equivalent doses of proteins in rats and tested what happened in equivalent ranges of 6g to 40g protein for the animals. The 6g test worked similarly — nearly twice the MPS markers — but the higher doses also had increased MPS. While those scores weren’t twice as good, they were reasonably good, which is exactly what we’d expect once we start getting towards the “protein ceiling” where many users’ protein starts spilling over into a blood sugar spike from gluconeogenesis. As we write this, Nutrition 21 (a company very much about research) is funding an overall effects study where they’re trying to compare actual gains from Velositol users. Stay tuned to PricePlow’s Velositol page for that, as we’ve been covering this interesting ingredient a lot. For the time being, know that this should help tickle in a bit of extra muscle protein synthesis, at least in the post-workout environment. The average Olympus Labs user is trying to get every last drop of natty gains out as they can, and Velositol is the exact kind of ingredient to do that. Reminder: This ingredient is only in the Muscle Building Edition. GABA in a protein powder?! What’s this sorcery? PharmaGABA is a natural source of GABA with new post-workout research on the way! While GABA is best known as a “relaxant” neurotransmitter, GABA also boosts growth hormone in larger doses. 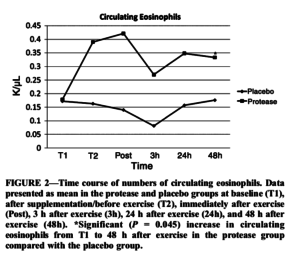 Now that study was done at 3g, so we don’t have that much here, but Pharma Foods International in Japan believes they can compound the ingredient to induce that GH spike post workout in a manner similar to what Velositol is doing. 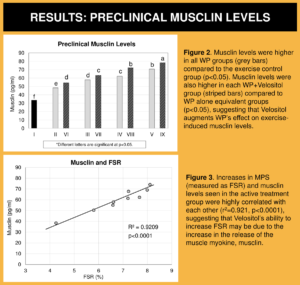 Preliminary data funded by Pharma Foods shows that combining a sub-optimal dose of whey protein (10g) and PharmaGABA increases plasma Growth Hormone levels more than 10g whey alone, and it happens over time too. There were significant GH improvements from baseline at 4, 8, and 12 weeks. 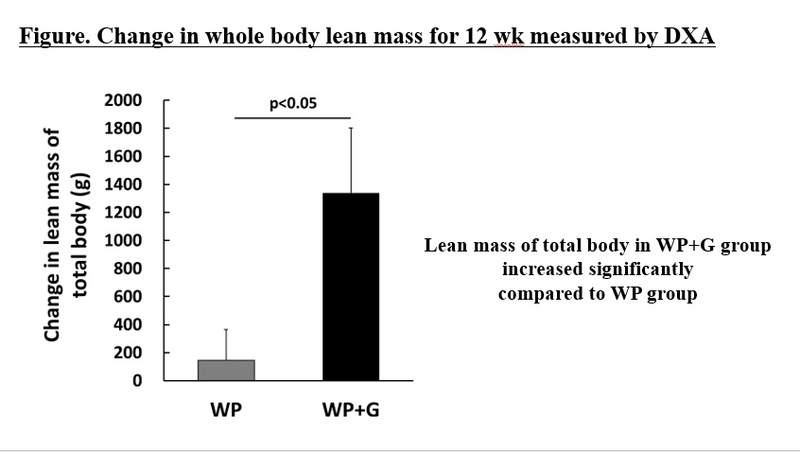 Meanwhile, whey alone only had significant GH enhancement at 8 weeks, and at 12 weeks, plasma GH levels from the Whey + PharmaGABA group were significantly greater than the Whey-only group. After twelve weeks, GABA + Whey seems to have some benefits, but we wouldn’t take this chart too far out of context until the full text is released. 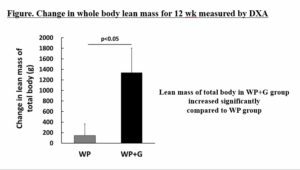 In terms of actual gains in this study, at the 12-week mark, change in whole body lean mass was significantly higher in whey+PharmaGABA group compared to that in whey-only group! Unfortunately, the paper is still not published and Pharma Foods International’s researcher could not share the full text and dataset (he was quick to respond and apologize that he has to wait until it’s published), but he’ll hopefully get us that as soon as it’s out there. The next question is, what are they doing to “enhance” the GABA in PharmaGABA? From another study where they’re using it for better sleep potential, they possibly tip their hat a bit, showing that they used 112mg of product yielding 100mg GABA, but also 4.7mg glutamic acid, 2.3mg other amino acids, 3.4mg minerals, and 1.6mg water. We’re not sure if that blend in this study is used in Superior Protein or what the “other amino acids” are, but we’ve asked and will update. PharmaGABA is produced via a fermentation process that utilizes Lactobacillus hilgardii, the same bacteria that is used to ferment cabbage in the preparation of the traditional Korean dish known as kimchi. Point being – similar to Velositol using some amylopectin starch to ‘trick’ your body into boosting chromium uptake and MPS post-workout, PharmaGABA seems do the same thing but with GABA in order to push a larger post-workout GH boost. We await more data, but you know Olympus Labs loves to live on the leading edge, so they’re first to use it and now you can be first to try it! 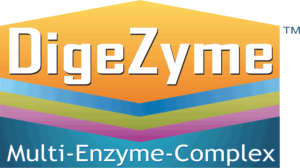 It’s always appreciated when supplement companies include a digestive enzyme blend with their protein powders. For dairy-based proteins, we love added lactase as a bare minimum, as this is the enzyme used to break down lactose. Amylase helps with starch digestion. It’s found in the saliva, but some people don’t make as much as others. Added amylase may lower insulin spikes! Lipase helps with fat breakdown. Superior Protein isn’t high in fat, with 1.8g per scoop being the highest you’ll see from any of the flavors, but it’s still good to have. 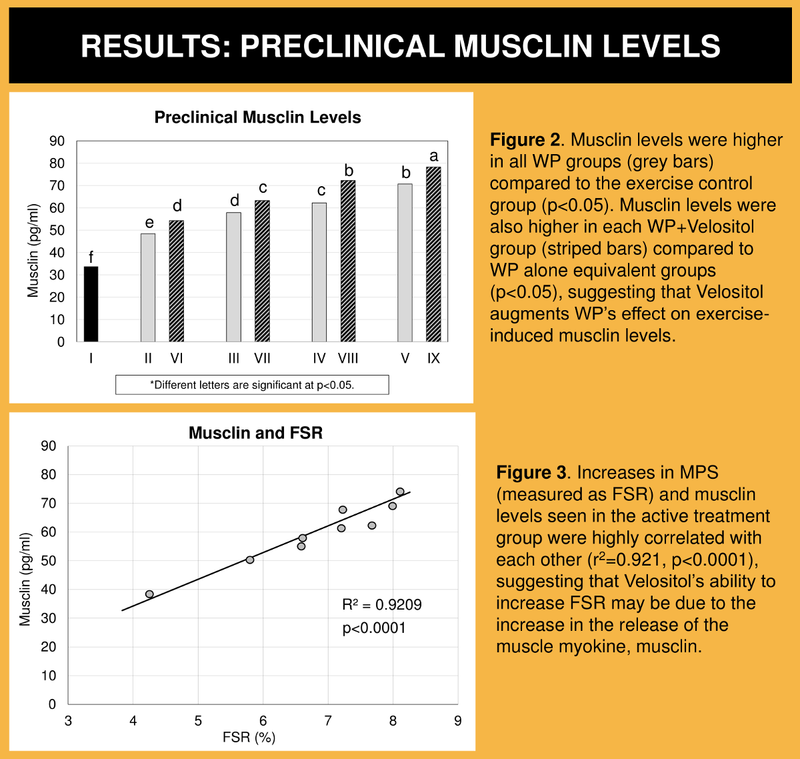 Even more post-workout enhancement – Protease and Recovery! 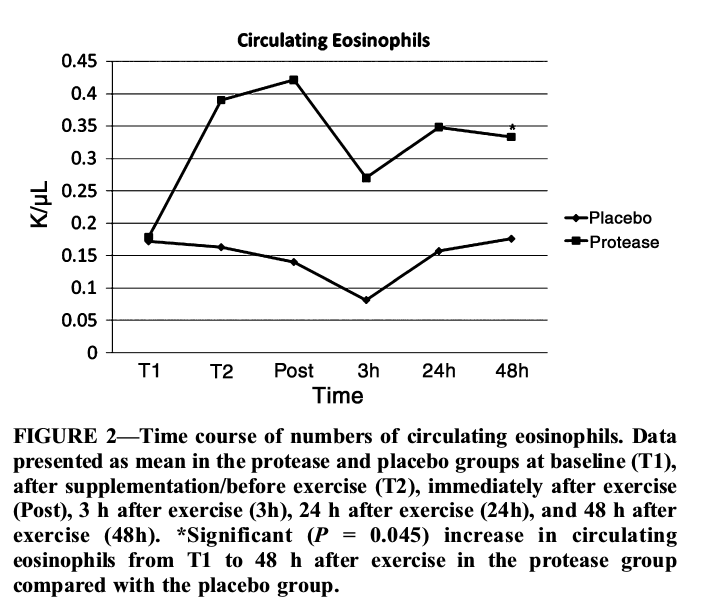 Could Protease help with post workout soreness and recovery? If so, why don’t we see it in more post workout supplements?! Beyond the post-workout MPS/GH spikes added from Velositol and PharmaGABA, there’s also research on protease adding more recovery benefits when used post workout! Olympus Labs really went all-in with the “extras” in Superior Protein! 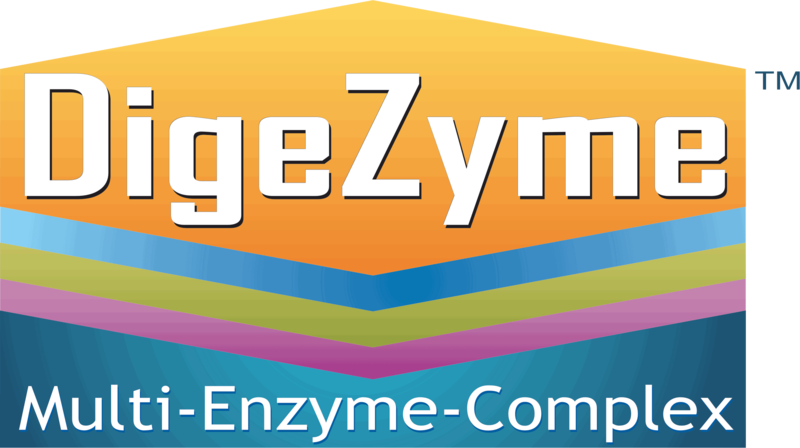 The only part of DigeZyme that’s probably “not needed” (but certainly doesn’t bother us) is cellulase, which is used to digest cellulose, or plant fibers. Not many plants in this beast! 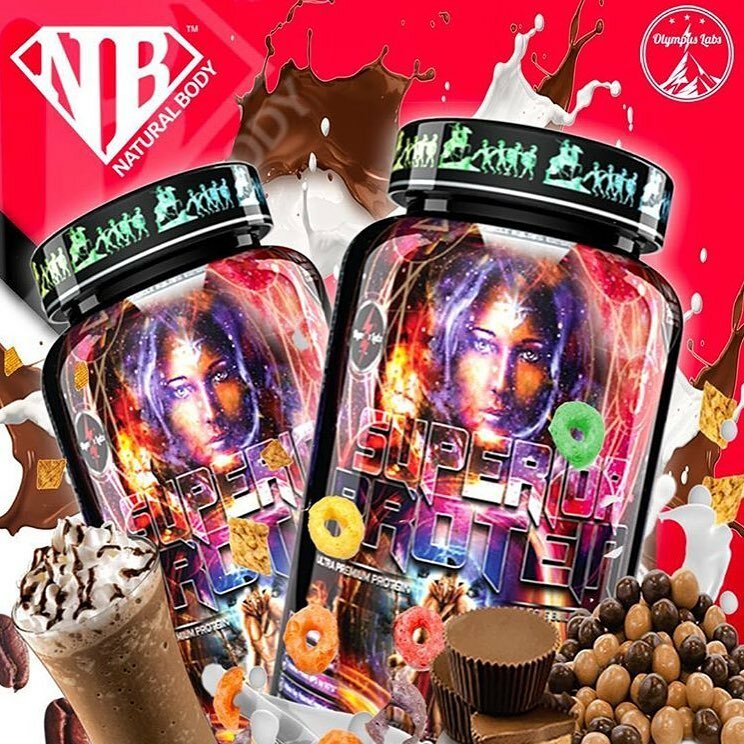 As can be seen by both of the added ingredients here, along with the casein protein (discussed in the section below) Superior Protein is likely best taken post-workout and/or pre-bed. There are nearly always benefits to protein consumption, but the research on these “bonus” muscle-boosting ingredients has been done in a post-workout setting. The label on the right is for the “Smash n’ Crunch Peanut Butter Cup” (chocolate peanut butter flavor) but that’s the one flavor that doesn’t have cereal bits (known as inclusions on the label, but better known as “Fixins” in my review above). The carb range is diverse because of those cereal bit inclusions. The most carb-heavy flavor is Mocha Mermaid, which not only has those cereal bits (and they’re kind of awesome – like Cocoa Pebbles), but cocoa itself also adds an extra carb. If you’re looking for lower-carb, you’ll want to stick with the Smash n’ Crunch Peanut Butter Cup, but that flavor doesn’t have the fixins, so the flavors I recommend most are the higher-carb ones. 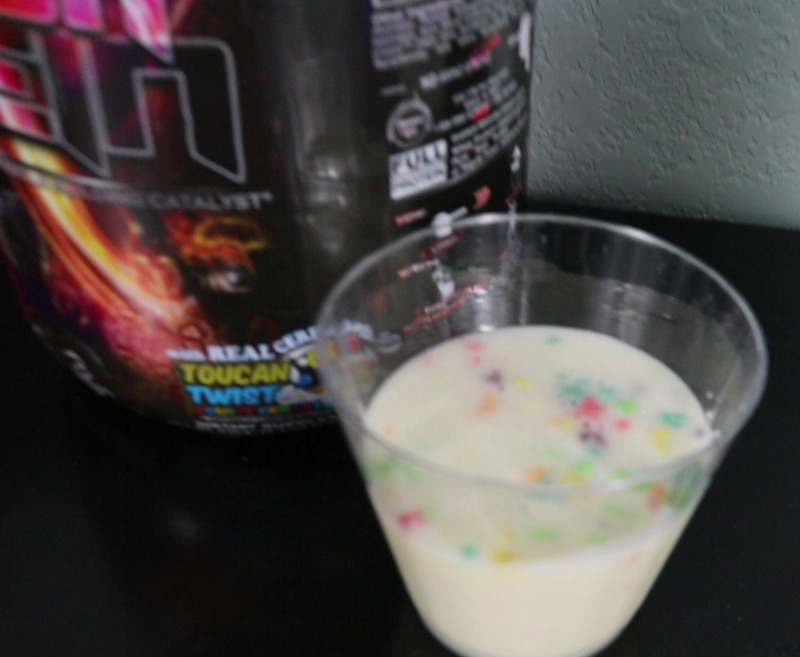 Point being… this is a product for Olympus Labs Demigods who chase gainz from carbs and generally not ketones! We all know and love whey protein for its high biological value, fast-acting amino acid release, and excellent leucine-rich amino acid profile. Once again, as discussed above, this is indeed WPC-80, it’s just not in the nutrition facts part of the label, per the lawyers’ requests. We’ve seen 50/50 Casein/Isolate blends, but a 50/50 casein/WPC-80 blend is going to be even thicker, even in 8oz water. We feel that casein is far too underrated and enjoy its addition as a feature part of the product — especially when you can make the “grittiness” at a minimum, which is what Olympus Labs did. 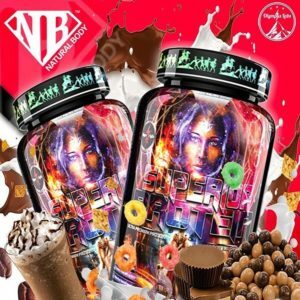 Superior Protein has some great stuff going for it even without the insane flavors… but they also have some insane flavors!! This flavor is top not only because it has cereal pieces, but because it’s different. This is Olympus Labs’ response to the cinnamon swirl and snickerdoodle flavors out there. Rather than cinnamon sweet, it’s got a gingery cinnamon sweetness! Some gingerbread cookies are very spicy — this is not that (although I’d welcome that too). Instead, this one’s more on the sweet side, and definitely brings something new to the table. Chocolate fan? Coffee fan? This one’s split pretty well down the middle, and it has what seem to be Cocoa Krispies or Cocoa Pebbles in there. 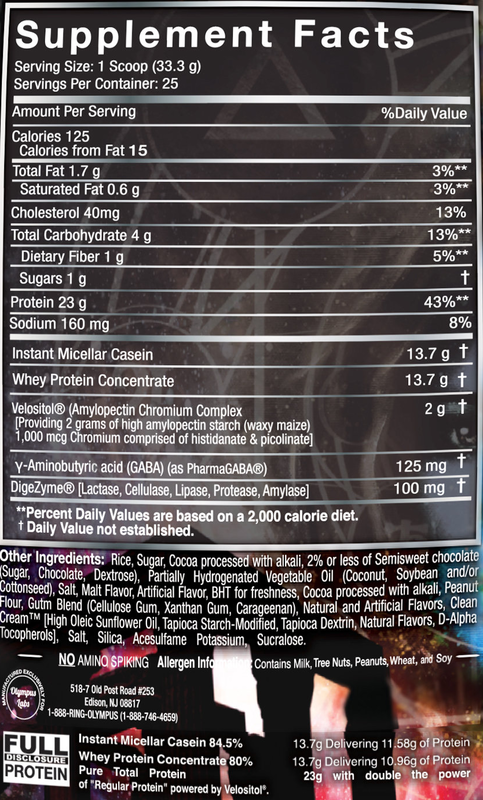 This is the highest carb product at 7g thanks to that cocoa, but they definitely didn’t wimp out on the coffee flavor here! Are those rice-based Fruity Pebbles in my Toucan Twist flavor? It sure looks and tastes like it!! Olympus Labs throws you for a loop here — you’re expecting Froot Loops, and that flavor is there, but the cereal pieces are more like Fruity Pebbles, and they’re the real deal! I never like these flavors for more than a scoop or two, but this one, I absolutely do. Listen, I don’t want to be a drag here. This is a good chocolate peanut butter flavor. Evenly split, not too artificial tasting, and lowest in carbs. BUT. Where are the fixins?! The bar had been set so high with all these other flavors including their cereal bits, and this one is… smooth?! No thanks, Olympus Labs! I want my cereal! But seriously, it’s a good flavor. Just… not as much “fun stuff”. Modeled off of Blueberry Pop Tarts, this one does have inclusions, I just never really get much out of these flavors (from any brand really)(, and this one’s not much different. Blueberry Pop Tart lovers may still want to jump in, but I’m not all about it. It’s not bad, I just can’t see myself wanting it against the rest! Launching at Natural Body Inc, Superior Protein has everything an Olympus Labs fan would want. Our spoiled selves just ask for cereal in our chocolate peanut butter flavor!! We’ve seen the review logs out there — Olympus Labs fans don’t fear the carb. They train dirty, and many of them are not afraid to gain dirty either. So when the brand finally decided to make a protein powder, why not throw away all inhibitions and use that to their advantage? In true Olympus Labs form, they added some new ingredients to attack natural muscle-building and GH-inducing pathways. But they also had some fun with their carbs, and they did it in the form of cereal protein that actually tastes good even without the cereal. But it’s even better with that cereal too. The biggest point of confusion is which version and which flavor to get — there are better deals if you have budget to try two or all five of them, so that’s one way to go. If you’re looking strictly for post-workout or pre-bed protein, then the PharmaGABA-enhanced version could be worth trying, but there’s added expense there as well. We’re honestly for either version due to our increasing admiration for Velositol — but we’re still sticking with our stance that all flavors need cereal pieces, so long as it’s one of the ones with cereal inside!! !, so long as it’s one of the ones with cereal inside!!!!! Comments | Posted in Supplement News | Tagged Amylase, Amylopectin, Carbohydrates, Casein Protein, Cellulase, Chromium, Digestive Enzymes, DigeZyme, GABA, Lactase, Lipase, Micellar Casein Protein, Olympus Labs, Pharma Foods International, PharmaGABA, Protease, Protein, Protein Powder, Velositol, Whey Protein Concentrate.